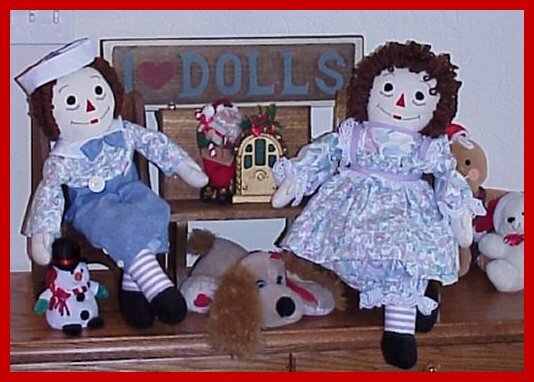 Straight from the Fairyland created by Johnny Gruelle in his delightful Raggedy Ann & Andy stories....come "Raggedy Ann & Raggedy Andy"....... JOHNNY GRUELLE'S FAMOUS STORIES OF THESE LOVABLE DOLLS ......HAVE AMUSED AND FASCINATED MILLIONS OF CHILDREN AND RAGGEDY LOVERS AND WILL CONTINUE TO DO SO AS LONG AS IMAGINATION REMAINS ALIVE !! 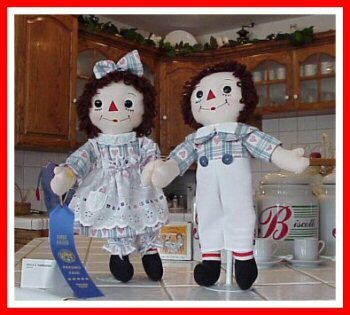 !......THE "DOLLS" ANN AND HER LONG-LOST-BROTHER ANDY HAVE TRULY CREATED MILLIONS OF RAGGEDY LOVERS WORLD WIDE !.......SCROLL DOWN AND LEARN MORE ABOUT THEM!! 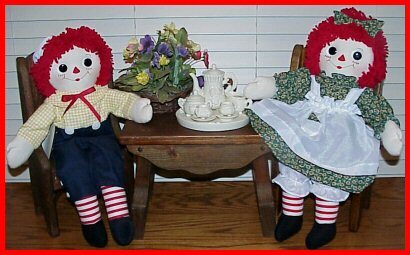 !.....they are just two of the many wonderful Raggedy character Dolls that I enjoy creating! 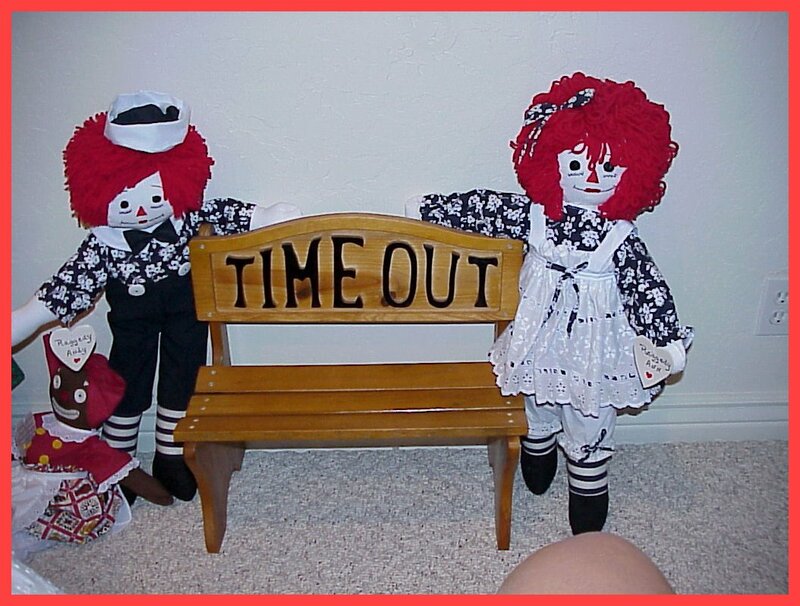 !....Please take time to check out ALL of my creations! !....WHY NOT COLLECT THEM ALL??? For More Information....e-Mail "Gayle" "Click Here!" for there were so many old forgotten things to find up there. 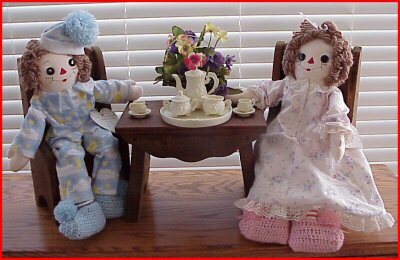 men and women in old-fashioned clothes. which reached to her shoe-tops. 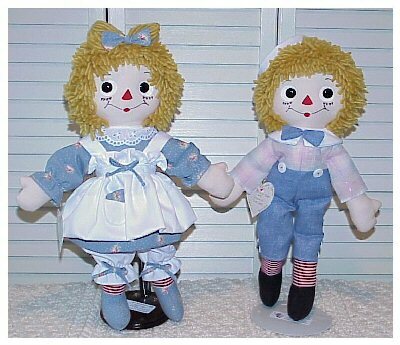 with only one shoe-button eye and a painted nose and a smiling mouth. Her dress was of soft material, blue with pretty little flowers and dots all over it. 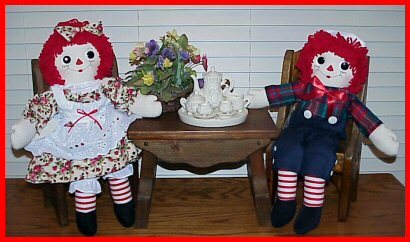 Marcella caught up the rag doll and ran downstairs to show it to Grandma! that so captivated his little girl, could be a marketable item. 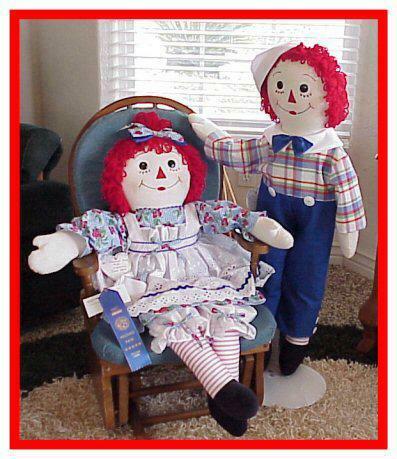 had inspired the name for his 1915 patent design for Raggedy Ann. 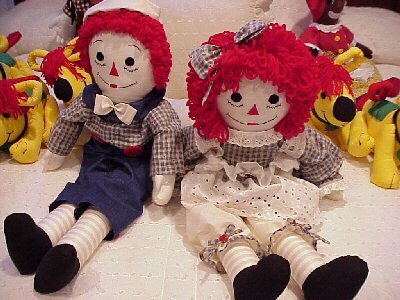 The earliest Raggedy Ann dolls "documented" were offered by the P.F. Volland Co. 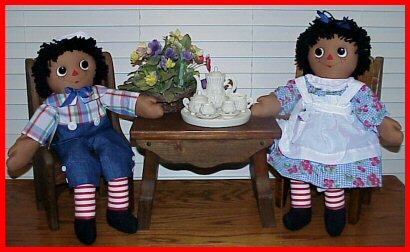 They were intended to be sold as related merchandise along with Gruelle's new book. To read this letter in LARGE PRINT just click on "first letter" above. 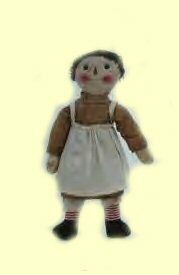 This doll belonged to my mother and she played with it when a little girl. and I went out under the arbor and had our little cry together. and hear the words of comfort(also imaginary) that were whispered in my ear. Let him share in the happiness of your household. (To read the letter in LARGE PRINT click on "second letter" above. 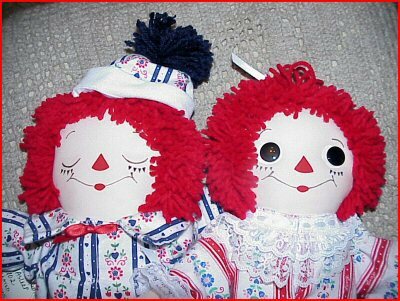 always played together; as I recall, there was no fence between our two houses. 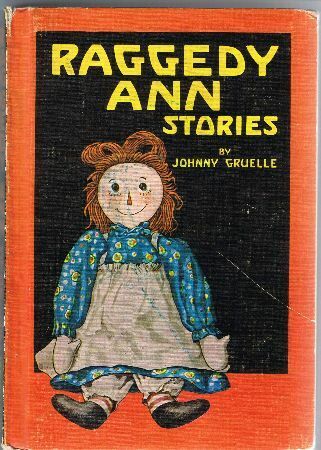 doll book, for Raggedy Andy must have had some wonderful adventures in his long life. and we all came to know and love him too! 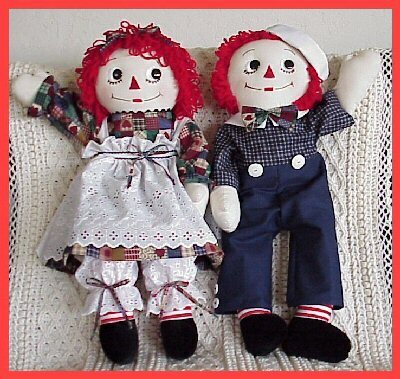 I currently have a variety of "READY TO SHIP" Raggedy Ann and Andy sets. 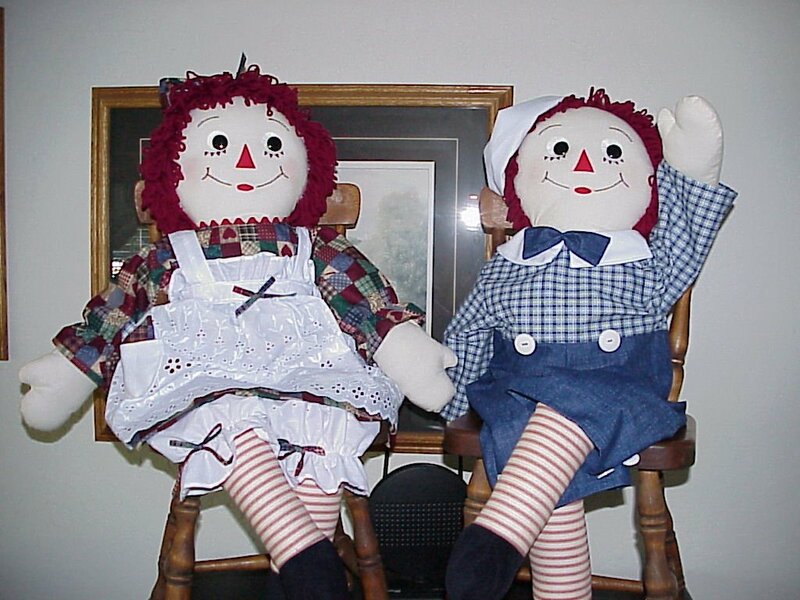 others have painted facial features with wigs reminiscent of the various styles of dolls of the past. 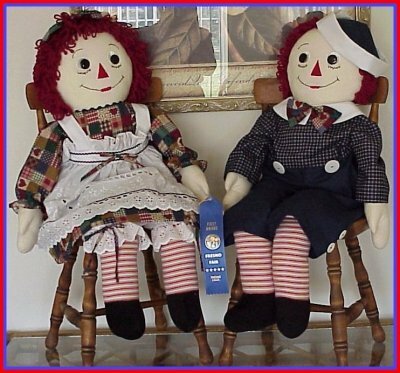 BE SURE TO CHECK OUT THEIR INDIVIDUAL PAGES .....I think you'll enjoy them! 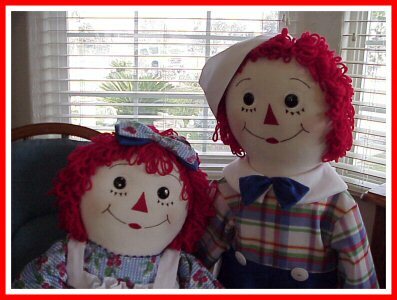 "Raggedy Ann" or "Raggedy Andy"
You may also SPECIAL ORDER an ANN or ANDY individually. "Harley Davidson Andy" I am open to any request! The "SETS" are numbered so I try not to break up the pair. 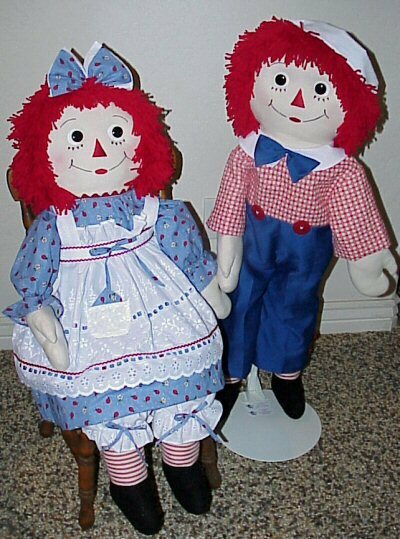 Sizes available range from 12 inch through 36" and I am working on even smaller sizes. 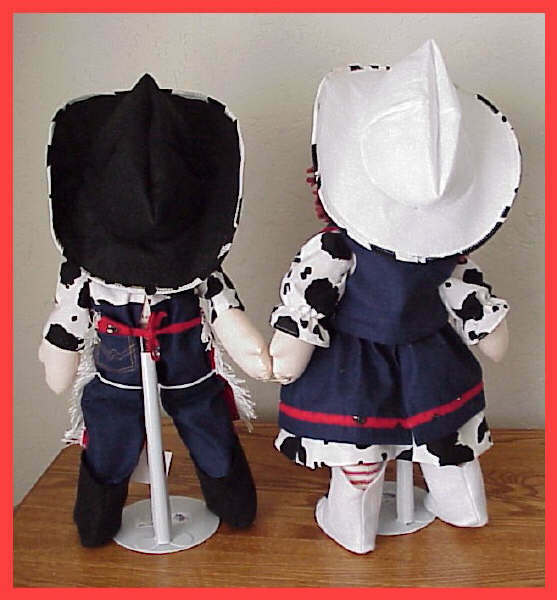 Approximately 25 various Fabric choices are available! If you would like to view a closer version of a particular color or print....it is just an e-Mail away! 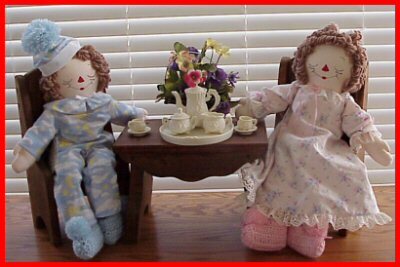 You can choose from a variety of Facial Features and skin tones too! 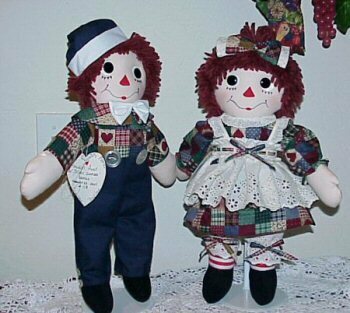 I am always working on new reproduction Raggedys .....and new Raggedy "Characters"
So Check back often to see New and Exciting additions!!! 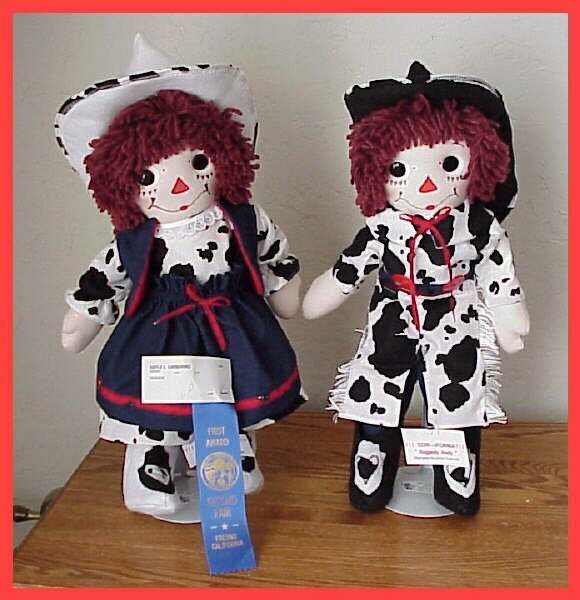 and become an Heirloom Collectible Treasure for your family for Generations to come! 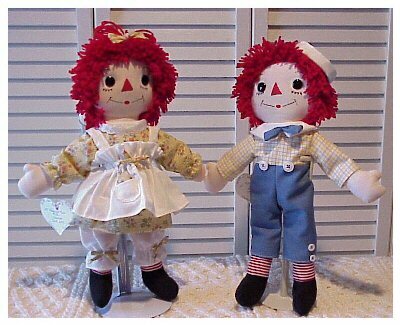 Here are a few of MY OWN re-creations of "Raggedy Ann & Andy Sets"